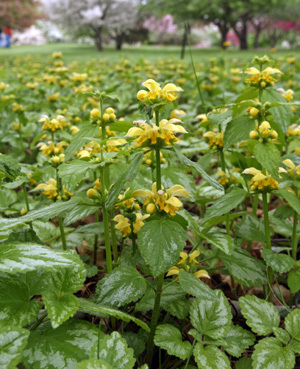 Yellow archangel is the common name of Lamiastrum galeobolon, an herbaceous perennial plant used as a low-growing ornamental. 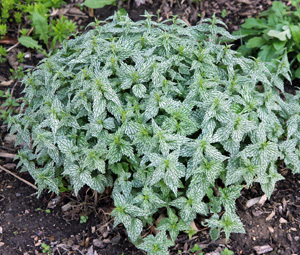 Lamiastrum means “resembling Lamium“, referring to the similar-looking deadnettles that are also grown as ornamental ground covers. This species was once classified as Lamium galeobdolon; that name and the synonym Galeobdolon luteum are still occasionally misused in the nursery trade. This Eurasian native in the mint family (Lamiaceae) is hardy in zones 4 (3?) -9. 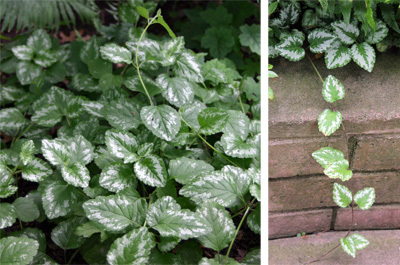 Variegated forms of this plant are popular garden plants, but the species is considered a noxious weed in western Washington State and other areas of the Pacific Northwest where it has escaped cultivation and invaded forested areas. It has the potential to spread into natural areas in Wisconsin, although is not considered invasive here and is not proposed for regulation at this time. 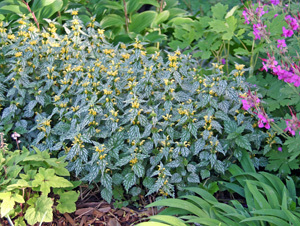 The leaves of cultivated varieties of yellow archangel are variegated with silver markings. The elliptical to triangular leaves have coarsely toothed edges, and acute tip and are covered with fine hairs. They are medium to dark green, but cultivated forms are variegated with silver markings. The opposite leaves are borne on square stems (typical of the mint family). 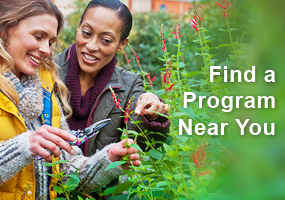 Plants are semi-evergreen, retaining their leaves through mild winters but dying back to the ground in cold climates in the winter and re-emerging in early spring. Plants grow up to a foot tall as a procumbent mat. This creeping plant spreads by rooting at nodes, from stem and root fragments, and by seed. The more upright, clumping variety ‘Hermann’s Pride’. 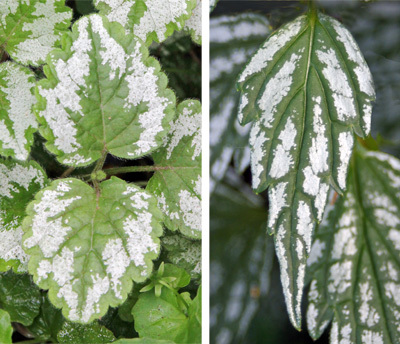 with diffuse, mottled silvery markings on the more rounded leaves. L. galeobdolon blooms for a few weeks in mid-spring, with a few flowers produced sporadically later in the year. The soft yellow flowers are borne in leafy inflorescences called verticillasters (resembling whorls but actually arising in the axils of opposite bracts; the tip continues to grow, producing more rings of flowers up the stem). Each ¾” long tubular flower has a prominent upper petal or “hood” and lower lip characteristic of the mint family. The lower lip is usually streaked red brown. The flowers are pollinated by bees – especially bumblebees – and are followed by inconspicuous brown nutlets hidden among the inflorescence leaves. Numerous seeds are produced from each inflorescence, with more in sunnier areas. When in bloom (L), the flowers of yellow archangel are borne in verticillasters (C), and each tubular flower has a prominent upper petal or hood and lower lip characteristic of the mint family (R). 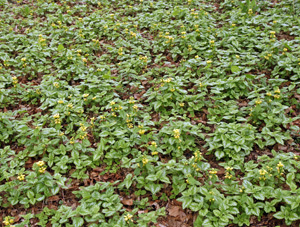 Trailing cultivars of yellow archangel, such as ‘Variegatum’ in this picture, makes a dense groundcover that outcompetes most other plants. The clump-forming ‘Hermann’s Pride’ combines well with other shade-loving perennials. bleeding heart (Dicentra spp. ), wild and European ginger (Asarum canadense and A. europeaum), golden Japanese forest grass (Hakonechloa macra ‘Aureola’) and hostas, especially the larger blue-leaved selections where its medium-textured, strikingly variegated foliage provides good contrast to the solid colors and large leaves. 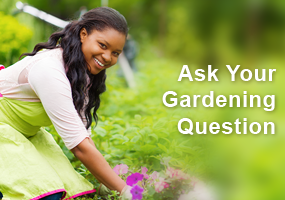 This plant has few pests, although slugs may cause cosmetic damage. Fallen leaves may get trapped in the trailing types, looking unsightly, especially where the leaves remain evergreen. 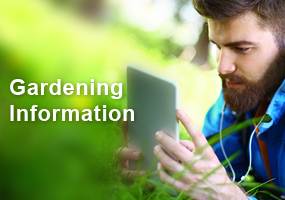 The cultivars can be propagated at any time during the growing season by division of crowns or from rooted stem cuttings. It should be illegal to import or sell this horribly obnoxious noxious plant in Washington state. It’s taken several years for my wife and I to eradicate it (we hope). Has anyone reported skin irritations from Yellow Archangel? This is my third year in a row breaking out with itchy welts after taming and cutting this ground cover. Could not figure out what was causing welts, but have narrowed it to this.